​There are many reasons to move away from the U.S. during your retirement years. One of the most important is that your money will buy you more. Another big reason is inexpensive health care and affordable prescription drugs. Click to Listen to Art Koff's interview on Israel National Radio addressing Areas to Cover Prior to Retiring Overseas. In the US alone, there are 10,000 baby boomers retiring every day, a trend expected to continue for the next 15 years. This means that about 3.6 million Americans are retiring each year. There are many reasons to settle outside of the U.S. during your retirement years. The number one reason is that your money will buy you more and living less expensively means you can live better and your savings will last longer. Below we have provided information and resources to help you decide if you should consider moving overseas and we have listed some of the reasons to do so. A significantly lower overall cost of living for the same lifestyle. This includes a lower cost for housing and healthcare resulting in up to a 50% savings compared to living in the US. These savings become even greater when taking into account personal services you may use such as housekeepers, repair and maintenance help, gardeners, etc. Access to high quality, inexpensive healthcare. Although the cost and quality of healthcare varies substantially from country to country there are many overseas locations that offer healthcare services equal to what is provided in the U.S. at a fraction of the cost. Lifestyle. Most retirement destinations overseas offer a slower, more traditional and often more relaxed lifestyle. 1) Evaluating your needs regarding lifestyle, pace of living…what is important to you. Do you get upset easily if you have to wait for a service or when a particular item you want to buy is not in the store? Are you bothered if someone who is supposed to show up at 9 AM shows up at 11AM or does not show up at all? If you are a “Type A” personality your choices overseas will be limited almost exclusively to the most developed part of the world, and even then, you may face challenges. If you can see past these challenges and can embrace an opportunity to live in a new environment you will be able to take advantage of an extremely low cost of living and have the opportunity to lead a more rewarding lifestyle with a substantially better standard of living than you could have afforded in the U.S. and you are likely to be able to afford this lifestyle for the rest of your life. When doing your research, check to see how overseas retirement destinations compare to your expectations. Not everyone’s expectations are the same. If you have a spouse or significant other his or her expectations may not be the same as yours. Go over this list together. Safety. If you don’t feel safe (regardless of the crime statistics), you may not feel comfortable in certain overseas locations. Of course there are places within the U.S. where you may not feel comfortable as well. Time to travel and ease of travel. If you plan to return often to the U.S. to visit friends and family, or if you want them to visit you, this is an important consideration. Lifestyle / cost of living. Is the beach important, what about restaurants, shopping, skiing, the arts, etc.? Do you want to live near the mountains or near the beach? How about access to both? What lifestyle will your budget provide? Politics / government / rule of law / stability. How comfortable are you living in a Socialist country, or where you must be careful with your interactions with the police or local politicians? Likelihood of natural disasters. Some places have hurricanes, volcanoes, earthquakes, flooding, etc. Attitude of the locals towards Americans. How do the locals view Americans? Climate. Many retirement destinations are hot and humid, while some can be chilly and others have a rainy season lasting several months; how does climate affect your decision? The arts. How important is access to museums, opera, symphony, ballet, theater? Sports. Do you wish to play golf, tennis, ski, run, bike, hike, scuba dive, or climb mountains? Do you wish to be able to attend professional or amateur sporting events? Shopping. Do you need to occasionally visit a “high-end mall” or is there a problem if your shopping choices are substantially more limited than in the U.S.? Healthcare. Do you have medical problems or a chronic medical condition that requires special medical attention or require that you live near a hospital? Language. Are you comfortable in a country where English is not the native language and perhaps is not spoken or understood by many of the locals? According to the editors: This is a qualitative assessment, based on real-world data gathered on the ground. For each category in our Index, we looked closely at what matters most to you when you’re considering an overseas retirement spot—everything from the price of bread to how easy it is to make friends or stay in touch with family. Land scams are prevalent in many countries where Americans plan their retirement. Check any projected purchase carefully with regard to the legitimacy of the seller as well as the laws governing ownership by non-local as well as foreign nationals. As an example in Mexico's Baja peninsula a few years ago, many U.S. retirees learned that deeds on their beachfront property were not valid, as they did not meet certain provisions of a national-security statute that permits only citizens to own land on. ECUADOR Ecuador is the best country in the world to retire to.. The country gets top scores in the Buying and Renting and Climate categories and scores high across-the-board in all other categories. Expats are drawn by the low cost of living, perfect climate, the beautiful and diverse landscapes and the favorable retiree benefits. PANAMA When it comes to the Benefits and Discounts for Retirees Panama has always ranked at the top with a perfect score of 100. 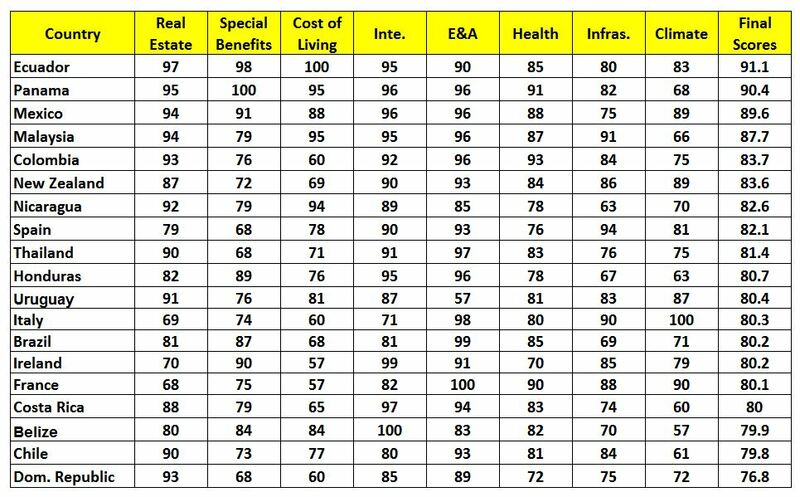 No other country does more for retirees. Panama has been, a long-time expat haven mostly for its famed Pensionado visa discount program available to anyone with a pension of over $1,000 a month. The Pensionado visa gives retirees 50% off their entertainment expenses, 25% off airfare, restaurants, electricity and phone bills and 20% off medical services. It’s pretty easy to get back to the U.S. from Panama, and it is possibly the friendliest country toward North Americans. It also also has the fastest Internet and best roads in Central America. MEXICO Due to its proximity to the U.S., the comforts of home are never far away in Mexico. Established expat havens in communities such as Puerto Vallarta and San Miguel de Allende ease the integration process, while excellent property can still be found for far less than you’d pay in the States. MALAYSIA Every year, more and more expats are waking up to the amazing opportunities Malaysia has to offer. The country has one of the most robust economies in Asia and this is reflected in the consistently high standard of living available to locals and expats alike. It’s just one of many factors that led it to being ranked the highest Asian nation in this year’s International Living index. COSTA RICA Costa Rica scores high points across the board, especially in the Integration and Entertainment and Amenities categories. Costa Rica is a hugely popular retirement haven for the climate, neighborly atmosphere, low cost of living, excellent health care, stable democracy and countless ways to have fun. MALTA AND SPAIN (tied) Tiny Malta enjoys plentiful sunshine year-round, on top of world-class health care (consistently ranked among the Top Five in the world by the World Health Organization) and tasty Mediterranean cuisine. The European island also has one of the lowest crime rates to be found anywhere. For those seeking sun and affordable living in Europe, Spain remains by far the best option available, evidenced by its standing as one of the highest-ranked European nations.. Although not as cheap as in most of Latin America, property in Spain is often of a high standard and far better value than in many other European countries. Likewise, Spain’s cost of living is lower than what you find in much of Europe. COLOMBIA For North American retirees heading south, Colombia is becoming an increasingly popular choice. Given all that this diverse country has to offer, it’s not difficult to see why. Colombia has an incredibly low cost of living. A couple can live comfortably on just over $1,200-a-month here. PORTUGAL Portugal’s mild climate, its low cost of living and its largely First-World infrastructure make it an increasingly popular European option. English is widely understood, especially in the large cities and — combined with the warm Portuguese hospitality — makes it easy to settle in and feel at home, whether you prefer sophisticated urban environments like Lisbon or one of Portugal’s many beach communities. THAILAND As Asia’s appeal to North American expats continues to grow, Thailand has become a popular destination. The country combines the best of authentic Asian cuisine and culture with enough North American influences to help you feel at home. Thriving expat communities already exist in the larger cities, such as Bangkok and Chiang Mai, and resort areas, such as Phuket and Hua Hin. There are too many websites that only tout the advantages of moving overseas, without listing the negatives. To get both sides check out this Best Places in the World to Retire as it lists over 4,500 answers to questions provided by experts. Visitors can use this interactive Location Advisor that provides help to determine the best places for you to consider. Here you can read information either written by "real life" retirees or based on interviews with them. Retire in Asia provides information on the best cities in Asia that you should consider as well as visa requirements, etc. Affordability: the world’s most affordable cities. Tax implication: IRS.gov provides you with the tax implications (click the international taxpayers section). ​Health care insurance for retirees living abroad. ​Retirees living abroad may or may not have access to local health care unless they have international health insurance. Some may want access to private medical facilities or additional benefits (evacuation, repatriation, dental / vision, etc.) not available through the local national health plans. There are also global plans that will cover those living as well those who may travel, anywhere in their “home” country. It is important to carefully check to make sure of coverage as well as access to adequate healthcare. Depending in the country healthcare insurance may have to be purchased here in the U.S. prior to relocating. Be aware that many plans will limit, deny, or terminate coverage for individuals at certain ages. To review and compare several top global health insurance plans, visit Compare International Health Plans. ​Unfortunately there are some confusing rules and a great deal of paperwork involved. Expatriates must file tax returns in the U.S. if they remain U.S. citizens. Preparing a return is complicated as, for example, in addition to filing a tax return expatriates must also file two separate forms reporting their foreign savings, stock holdings, life insurance, retirement plans, annuities and other financial information. All amounts must be converted from local currencies into U.S. dollars. Most retirees living overseas need professional help in preparing their taxes as the fines for even unintentional are substantial. ​Information was provided in part by Douglas Goldstein of Profile Investment Services, Ltd. Many Americans who retire abroad discover that it’s difficult to maintain or open a U.S. brokerage account from overseas. Some brokerage companies you may have worked with for years say that since you’ve left the U.S. they can no longer trade mutual funds for you, give you advice, or provide services for other issues. Despite what the brokerage firm may say, there are no laws against you keeping your assets in the U.S. while you live somewhere else. In most cases, you can continue to handle your American stocks, bonds, mutual funds, and bank deposits when you live overseas; however you need to know what forms you’ll have to sign, what are the address requirements, and what investments you can and cannot hold. If you’d like answers to some of the most commonly asked questions, fill in this short questionnaire and the answers will be customized for your personal situation.